I've always stayed pretty clear from printed trousers as they can be notoriously unflattering, however I'm certainly partial to the odd Motel offering as their prints are always to die for; the 'Windsor Blue' print is definitely one of my favourites of theirs. Teamed with this simple, uber comfy sweatshirt from Oasap and my trusty biker jacket and I'm good to go. Motel actually sent over these trousers as one of my items to wear at LFW but unfortunately I only made it there on two of the days! 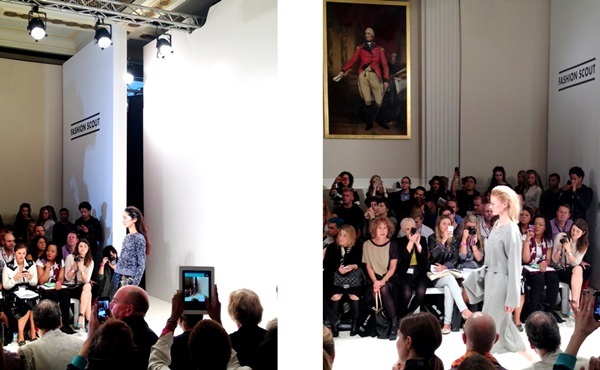 Read my posts about Fashion Week here if you missed them. Another bargainous gem from Missguided's 'Sweet Deal' range today! I seriously cannot get enough of it. 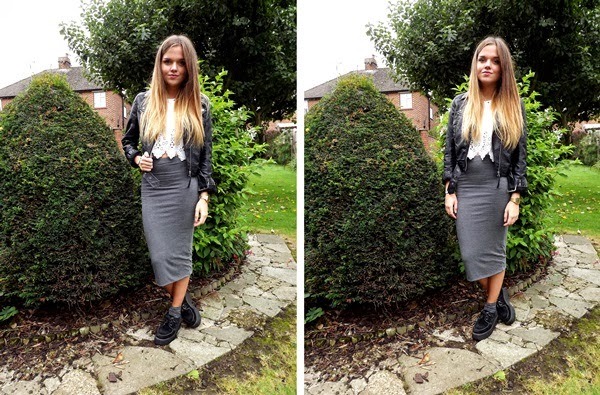 This skirt is absolutely identical quality-wise to the Topshop double-layer midi skirts, but is about £14 cheaper! And there are so many other great basics in the range that you can get hold of without breaking the bank. Also, this biker jacket is currently part of H&M's '50% off online for 2 days' deal, so if you fancy one I'd snap it up quick. 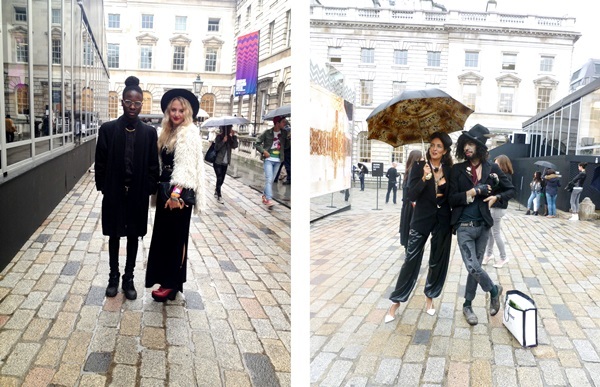 For the final day of London Fashion Week warmth was definitely key, as it was freezing cold and raining! So I opted for my favourite Topshop jumper and coat, and this gorgeous burgundy leather skirt from Motel's vintage collection, which is definitely worth checking out. I'm literally gob smacked at how good Motel is getting; everything in stock at the moment is so on point, and they have some great new styles and prints that are quite literally to die for. 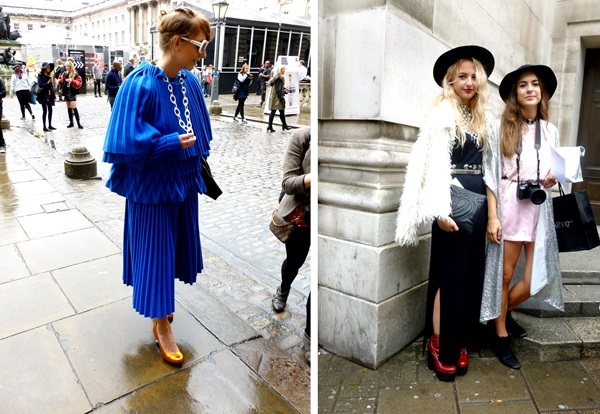 I've also included New Look and The Muse TV's LFW Street Style video, as at around 1:00 I'm interviewed! I thought it was pretty cool, and I was so chuffed to actually be in the final cut as they seemed to be doing so many interviews that I was certain my bit wouldn't be included; although I cringe every time I speak, I thought I would share it with you all as some of you may enjoy it. There are a few other bloggers in there too, so look out for those! After having such a good day at Fashion Week on Friday, I decided to head up again yesterday afternoon for the final day, and brought my friend Tom along for the ride. 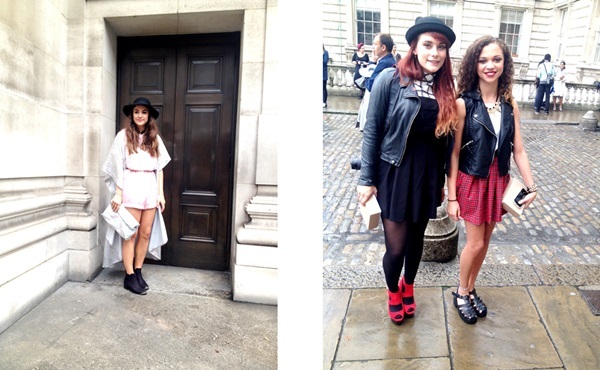 We started off at Somerset House, before walking to the May Fair Hotel for the Fashion Monitor Style Lounge. It was beautiful in there; they were showcasing Superdry's new collection in collaboration with Timothy Everest that will be launching later this year (I'm not normally a Superdry fan, but some of those coats were gorgeous; such attention to detail!) as well as their new make-up range that will be launching in February. There were a couple of other brands dotted around that we had a nosey at, before eating copious amounts of Green & Blacks and heading out into the rain to go to a show that I had been looking forward to all weekend; Lucas Nascimento. 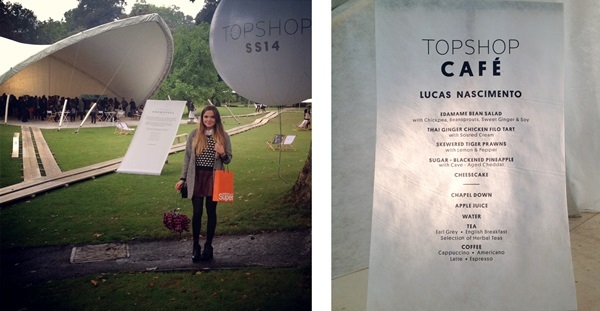 The main reason why I was so excited was because he was showing in the Topshop Showspace in Regents Park; it was amazing in there! There was plenty of champagne, delicious canapés, and to top it all off we managed to get a seat; needless to say my feet were extremely grateful! Of course I was also looking forward to seeing the clothes; after doing a little research and looking at his AW13 collection online I had high expectations, and he certainly did not disappoint. The collection was absolutely beautiful - very polished and clean, with simple silhouettes, asymmetric neck-lines and jackets, and plenty of mesh detailing. Everything was very wearable, and there was one particular coral mesh-knit tee that I definitely wouldn't object to having in my wardrobe for SS14! I think the collection, combined with the great location, made this my favourite show out of the few that I was lucky enough to attend over Fashion Week; all in all, a great end to a great few days of fashion. As before, outfit details will follow tomorrow! Also, I'm now officially totalfashionjunkie.com! I bought the domain last week, and after having various irritating issues (as those of you who follow my Twitter will know), it should be working perfectly now. I'm hoping this is the first step towards making my blog a whole lot more professional/generally better quality over the next few months, so get ready for some changes! 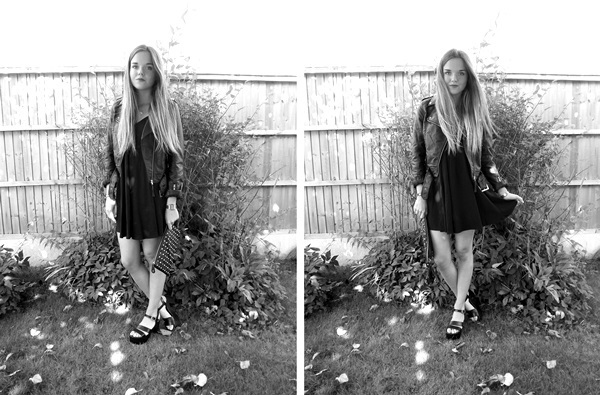 As promised, here are all the details of my first LFW outfit. I was sponsored by Motel so am wearing one of their lovely kimonos which, I was delighted to realise, is actually really warm! The only faux pas of the day occurred on my way home when the strap of my heels broke on my way to the tube, so I'll be taking those back to Topshop ASAP to get a refund; I'm so gutted because they were so comfortable and were fast becoming my favourite shoes, but I guess that's what you get for a (relatively) cheap high street purchase! Hopefully I'll be able to get my mitts on another pair. I pretty much said it all in my last post, but I really did enjoy my first experience of fashion week and would strongly recommend that you pop down to Somerset House if you can, even if you haven't got any shows; it's great just to people watch! I think it can be quite intimidating going there as a blogger (or as anyone really, I felt quite inferior to so many of the other girls! ), especially seeing as it's all about appearance and you can almost feel the judging eyes upon you! But there's still a lot of fun to be had, and despite only attending the smaller shows I was extremely grateful to even have been allowed into those! Camilla wrote two great posts on the much-discussed 'frow' and the place of bloggers at Fashion Week, both of which make some great points that I wholeheartedly agree with; I would try and summarise but she puts her point across in a far more articulate manner than I could, so have a read of those if you fancy pondering the subject further! That is all for now - more Fashion Week-themed posts will be up later in the week! Yesterday marked my first foray into the exhilarating whirlwind that is London Fashion Week, and boy was it a day to remember! As the crowds poured in and the rain poured down (making those notorious cobbles even more treacherous, as I soon discovered), the day promised to be fabulous from start to finish. Although the shows were of course the main event, there was so much more to the day than simply finding out what trends will be big next season. A beautiful room in the Waldorf Hilton had been taken over by New Look as a 'Refuel Room' for bloggers (equipped with photo booth, makeup artists, a smoothie bar, delicious food and copious amounts of champagne, all of which I took full advantage of) and just next door Handpicked Media had also set up a chill-out lounge, both of which gave a lovely bit of respite from the rain. 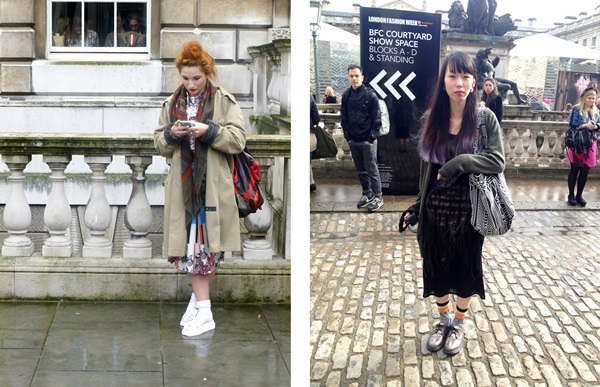 Even strolling around Somerset House, umbrella a kimbo, was a treat! I started with the obligatory round of celeb spotting, before trying my hand at snapping some street-style photos; I've never seen so many well-dressed people in one place in my entire life! The first show I attended was the Fashion Scout 'Ones to Watch'; I loved Hannah Williams' collection - a mixture of texture, glossy PU, raw edges and boxy silhouettes in muted shades - but it was Helen Lawrence that really stood out among the 3 designers in the show (the other being Renli Su). Her cable knit jumpers with graffiti-like prints and frayed edges (pictured above) are something that I can easily see the high-street rushing to replicate, and the same goes for the clear PU skirts. Unfortunately it was near enough impossible to get decent photos of the catwalk with my point-and-shoot due to all the lights, but I'm sure a quick Google search will get you better photos of the collections in question! I also really enjoyed Merit Award winner Yulia Kondranina's collection; again, photos were difficult, but the intricate, geometric crochet and sheer panelling got me from the word go, and are definitely trends I'll be looking out for when SS14 rolls around. Despite the obvious talent of all the aforementioned designers, the show of the day for me (and the one that had me and my LFW partner in crime, Tiger, gushing with praise) was Bernard Chandran. The entire collection appealed to my inner magpie, with opulent jewel shades, holographic metallics and angular cut-outs dominating, along with the most beautiful glittery gladiator sandals that I've ever set eyes on. There was one particular metallic, tailored purple jumpsuit that really caught my eye; if anyone can hook me up with either that or the little green shift dress for my prom next year, please feel free to drop me an email..
An inspiring day of shows, free food and drink, goodie bags brimming with amazing products, mingling with bloggers, being photographed and interviewed, going backstage at shows, regular near-misses in the falling-flat-on-my-face department and even a fleeting moment of fame on ITV news last night, was brought to a lovely close by a Nando's in Covent Garden with the London's Closet girls and Tiger. I wish I could have stayed for some after parties and gone again today for round two (I had invites to Ashish & Helen van Rees and I'm so gutted I missed out!) but unfortunately work beckoned. I may well head back another day this week as there are a few more shows that I'd love to see (watch this space), but for now I'm perfectly content with having been able to experience the mighty London Fashion Week first hand even if just for a day; it made me realise that fashion is an industry that I need to be a part of, and has inspired me to work even harder at my blog from here on in! Make sure you check out my Instagram (@amymacee) for more photos and videos from Day 1, and read tomorrow's post to see full details of my LFW outfit! In other news: 1) I'm so so so excited for Fashion Week (I'll deffo be there on Friday and hopefully on a few of the other days), 2) I launched a giveaway yesterday which you can enter by clicking here, and 3) I lowered some of the prices of items in my blog sale and will be updating it this week with more things, but click the banner below to have a browse of what's available at the moment. That is all! After seeing this delightful LBD on a gazillion different bloggers, I just had to get my blogger-hype-lovin' mitts on one. 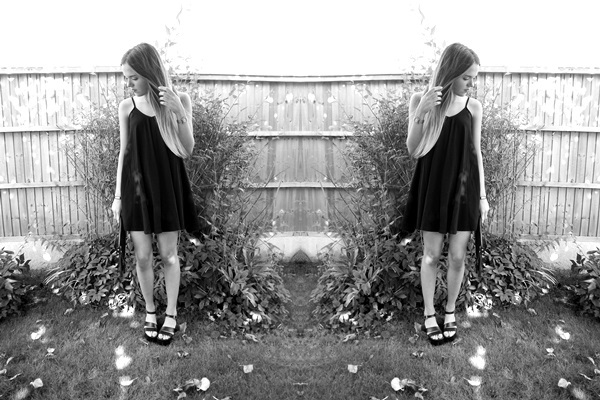 It fulfils all of my expectations and more - soft, comfortable, flattering, and not too short. 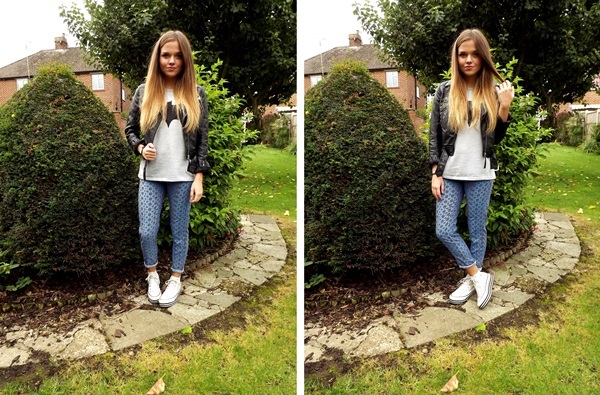 Once again, Missguided have done a stellar job! I'm contemplating wearing this outfit to a big family party tonight, although this Motel number is also a contender! One thing that is for certain is that my new favourite heels will be strapped onto my feet no matter what. I hunted them down on Oxford Street the other week and have been desperate to give them they're first outing ever since; hopefully they will fare well, and will be nicely broken in in time for Fashion Week in just under a week's time!